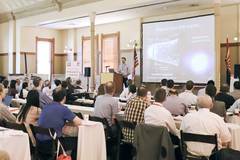 Bedford, NH: LASER COMPONENTS USA, a specialized provider of laser and opto­electronic components in the US and Canada, is pleased to announce the 6th International WORKshop on Infrared Technologies, a continuation of the alternating event in Germany and the US. Thanks to the support of MIRTHE+ Photonics Sensing Center, a leading organization focused on connecting research and industry, the event will take place at Princeton University, NJ, October 28 – 30, 2019. A detailed program, list of topics and speakers, along with the online registration form is coming soon.